So every summer I binge on the crafting that I can’t do the rest of the year while I teach. Several people wanted to know how I did a few of those crafts so over the course of the next few posts I will share some of these crafts! The first project was a doll for Wyatt’s best friend Lillie. She was about to have a baby brother and I knew she would want to get in on the action and care for a baby as well. I was just going to go to Walmart to buy a little baby doll when I discovered that Walmart thinks all babies born are blonde haired and blue eyed. Well, Oliver was not going to look like that so I decided I better take the logical next step and make her a doll. I chose to work with polar fleece which was the best decision I’ve ever made and I’m really shocked that more people don’t use polar fleece for doll creating. It is soft, comes in a variety of colors, the material doesn’t fray, and is super easy to work with. Size was the first thing I need to workout. 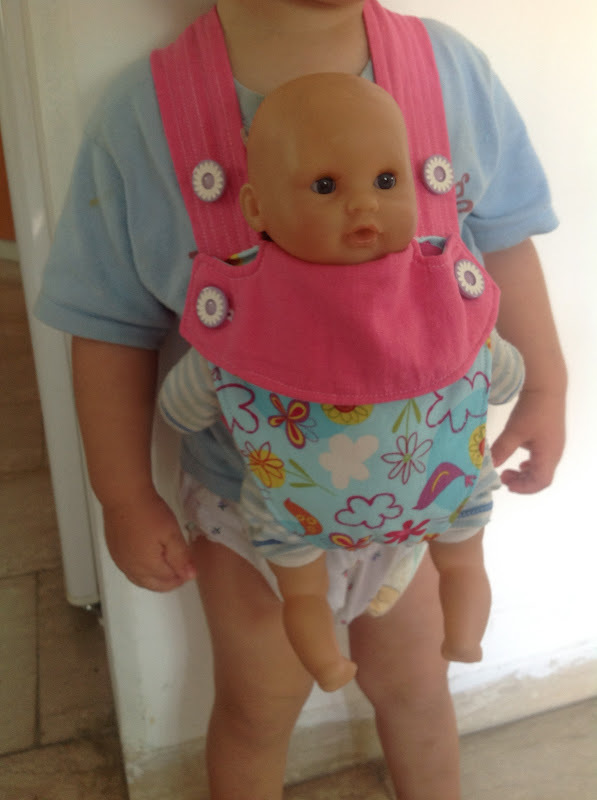 I decided that if the doll fit preemie clothes that would be easy. I wouldn’t have to make clothes, I could just buy preemie clothes. Bam done! Well not so fast. I bought a preemie sleeper and then tried to figure out what size doll could fit. I measured and did all sorts of things and then decided to go a very strange route that worked. I drew a quick silhouette of the sleeper on a piece of cardboard, it happened to be a Nike shoe box. Then I eyeballed how long the arms and legs were and bent them, not physically I just redrew it right over the top with bent arms. I really should have taken pictures of this part of the process! I kept redrawing and redrawing until I thought it looked about right. I then cut out the cardboard and tried to put the sleeper on it. It was too tight so I cut a bit here and a bit there and tried it on again. The body was too wide. So I cut down the middle, overlapped the cardboard, taped it back together and tried on the sleeper again. I did this many times until it seemed just right. Then I cut two of the bodies out of the polar fleece. I then began the face and hair. I used felt to create the eyes. I made the white part almond shaped and decided he would look to one side. I then made little brown circles sewed them together. Then of course I added a little reflection point. I did this with thread just zigzagging back and forth. After I had made the eyes, then I cut out the face which I decided would be an oval. In retrospect I would have made it more of a circle because when I sewed the head to the neck I lost even more height to the oval and I feel like it became too wide without enough height. I also cut out the hair. This was just a piece of polar fleece that I satin stitched to the face oval. The back of the head was just another of the face ovals with hair almost covering the entire thing. I forgot to take a picture of the back. I was pretty happy with how it turned out. I then used a satin stitch and flesh colored thread and attached the head to the body. Then I turned right sides together and used my serger to sew the front to the back leaving the side open. I turned the whole body and stuffed him. Then hand-sewed him up. I love working with polar fleece this part was a breeze! The legs are pretty wide set but they make putting on a diaper so easy for little hands. This is the sleeper I used to create him! After this I made a few diapers just by cutting them out and sewing them right sides together and then sewing velcro on them. Here I am sewing them while illustrating the perils of sewing outside of nap time. Then I made this carrier using a blog I found on Pinterest. While looking for a baby doll carrier tutorial, I came across a couple of rather interesting ones and deconstructed some actual baby carriers. What follows is my own simplified version, which did not have too many buckles, ties and fiddly things for my two year old to deal with. Though it is not rocket science, I thought I would make a more explicit tutorial. Warning: this is not to be used for a real baby, but for toys only! Here is the template as pdf. From the printout, cut on the outer edge of the pattern. Once you have cut out your template, add an extra 1/4 inch all around when you cut the fabric. Sew with a 1/4 inch seam. This of course depends on the size of the doll and the size of the child. Adapt accordingly when drawing your template, so that you can have a better idea as to how much fabric you will need. 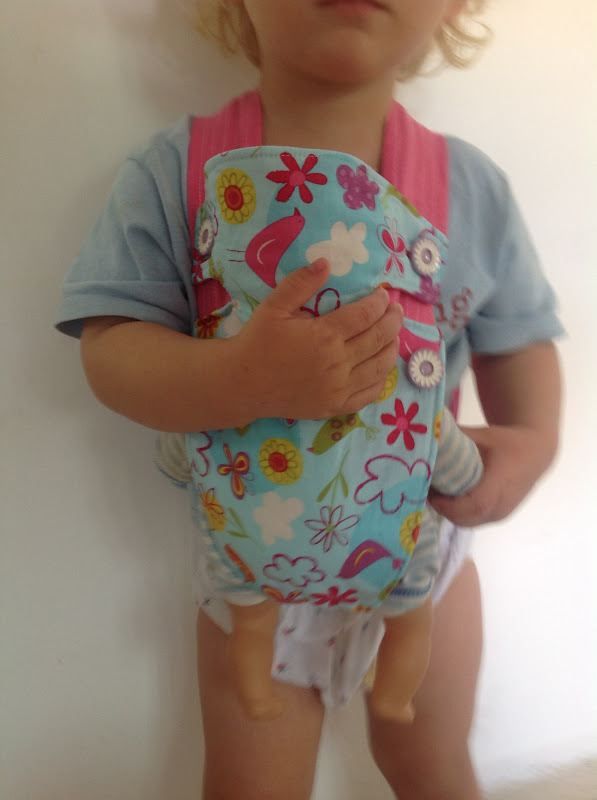 In this instance the doll is 12″ (30 cm) from top to toe and is 4″ (10 cm) around the belly. The child is an average two year old. Here is the template I drew up inspired by a well known baby carrier and others out there. You can see the proportion compared with the dolly. In this instance, the template measures 8,5″ (22 cm) across at its largest and 3,5″ (9 cm) at the bottom of the tail. The length is 11″ (28 cm). There are three layers here starting from the top: the exterior decorative and the interior prints right sides facing each other and finally the cotton batting. Polyester batting would probably work just as well or even some denim – anything to stiffen it up a bit. Sew around, but leave openings for the straps that will be added in the next step. There are three openings. If you think of this template as a fish, then you would not sew the bottom part of the “eyes” and the end of the “tail”. If you will notice the pins on the bottom of the carrier and almost on the top – this is where I left openings to insert the straps. You will need two straps, which in this case measure 27″ (69 cm) long and around 1,5″ (4 cm) – 2″ (5 cm) wide finished. Simply cut a long strip with the appropriate length, but 4″ (10 cm) wide and fold it lengthwise with the print facing in. Sew down all the way, pull it right side out and top-stitch up and down to strengthen a bit. Since my daughter is still rather small, I inserted the straps so that there is still some length of strap to pull out when she grows bigger. Here you can see how there is a flap on the top that is to be the optional head support for the doll. Kindly note that this section is not to be attached to the straps in any way. On the back, the straps are criss-crossing. Please make sure that the straps are not twisted before pinning and sewing. … or up. The button holes should fall nicely on both the straps and the bodice, so that they will catch both pairs of buttons. Check this before making the button holes. The carrier is put on over the head, which does require some assistance for the little one. But once on, it is all hands free carrying. And here it is with the flap up to support the doll’s head. Big brother got a bit jealous because he thought his sister got a pretty nifty toy. Perhaps another one needs to be made for my son and his trusty pal Paddington. Next item in this project – bibs. PS: Feed-back on this tute are very welcome. Thanks in advance. Here he is in his cute little carrier!